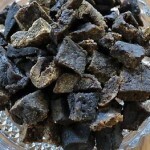 Home » Food/Treats » Can I Feed Bones To My Dog? Can I Feed Bones To My Dog? Dogs and bones seemingly go together like peanut butter and jelly; but, are bones really a healthy snack for our dogs? A growing number of veterinarians are warning pet owners to avoid giving their pets bones as treats due to the potentially harmful implications they have for sensitive digestive tracts. Listed below are the many types of bones available to dogs and whether or not they are safe. 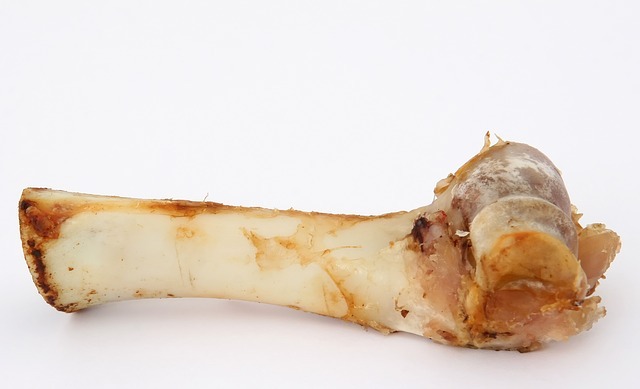 Cooked bones, particularly poultry bones, are never recommended for a dog because they become brittle during the cooking process, leading to an increased chance of splintering. Bone fragments cause numerous issues for dogs, including abrasions in the mouth and throat, vomiting, intestinal obstruction, constipation, diarrhea, and perforations in the intestinal tract, which can be deadly. A common treat for a dog is the rawhide bone, which can be purchased at any pet store and is comprised of the inner hide of cows or horses after the flesh has been highly processed. A major concern, especially for flavored rawhide bones (including flavors such as bubblegum or hickory), is that the manufacturing process may leave pets exposed to harmful ingredients, preservatives, flavorings, and toxic contaminations. Under FDA regulations there is no mandate for rawhide bones to follow the Association of American Feed Control Officials (AAFCO) pet food regulations, since they are not considered “food.” Next, if your pet does not suffer any ill-effects from possible contamination, there is the issue of safety. Technically, rawhide bones are intended to be chewed, not consumed. However, the majority of dogs swallow these treats, which are largely indigestible. Rawhide bones are a top choking hazard for pets, as they can easily become lodged in the esophagus. Common side effects of raw hide bones include salmonella poisoning, vomiting, diarrhea, bloat, and chemical exposure. Another potential danger lurking in pet stores are commercially available bone treats, such as smoked knuckle bones, ham bones, femur bones, and rib bones. 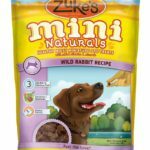 The FDA released a statement indicating that these treats are not recommended for pets, as they can contribute to a number of side effects including vomiting, diarrhea, intestinal blockages, mouth/throat abrasions, choking, rectal bleeding, and death. 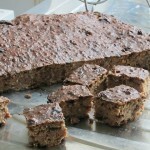 These treats are mostly harmful because many have been smoked or dried, which renders them especially brittle and prone to breaking. Additionally, the flavorings, seasonings, and preservatives may contain toxic ingredients for pets, as they are not regulated by the FDA or AAFCO. While commercially available bones are often not intended to be consumed by the dog in one sitting, many animals cannot resist swallowing large fragments, which is when most problems occur. Followers of the Bones and Raw Food or Biologically Appropriate Raw Food (BARF) diet insist that raw bones are safer for dogs due to their pliable nature, resistance to splintering, and teeth cleaning abilities. Many proponents of the BARF diet also claim that since canine ancestors survived on raw meat and bones this dietary approach is most natural for household pets. While there is much to be said from both supporters and critics of BARF, the fact remains clear that many veterinarians recommend owners exercise caution when giving a dog a bone that is generally considered safe. The American Kennel Club advises supervising any dog that is chewing on a bone at all times, and taking the bone away once the dog begins consuming broken off portions as intestinal obstruction can still occur with these softer treats. Dogs should be limited to 10 – 15 minutes of “bone time,” after which the bone should be stored in the refrigerator for up to three days. Additionally, these raw bones should never come from poultry or pork sources, as they increase the risk of the dog contracting (or spreading) a food-borne illness. There are a number of bone alternatives that pet owners can safely give their dogs without worry of food-borne illness, exposure to toxins, or potentially fatal side effects. Nylabones (or similar products) that are made in the USA from durable plastic are a great bone substitute, especially if your dog is a heavy chewer. 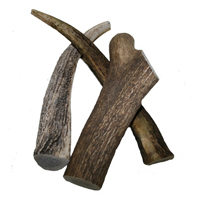 Elk and deer antlers are also touted by many pet owners as safe alternatives to broken down bones; however, pet owners should be vigilant if their dog is a strong enough chewer to break the antler into pieces. For pet owners that are concerned about their dogs’ destructive tendencies, large carrots are a great option. 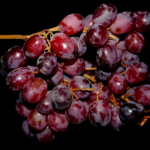 Not only are they safe to be eaten, but they are low-calorie, non-fat, and provide necessary nutrients and fiber (and smell better than most dog chews). Peanut butter filled KONGs (especially the KONGs made for heavy-chewers) are also recommended. For pet owners that would like to give their pets nutritive treats, this list describes alternatives for bones or rawhide chews. Use caution when giving your pet any treat or toy that can be broken into pieces and consumed. Owners of senior dogs or breeds that are naturally prone to brittle teeth (such as toy-sized dogs) should always use extreme caution when giving hard items to their pets due to the risk of broken teeth. While raw bones are generally considered safe for pets, care should still be used to ensure intestinal obstruction does not occur if the dog swallows large pieces or fragments of bones. When purchasing treats for your pet, always look to ensure the label states the product was manufactured in the United States and adheres to AAFCO regulations. 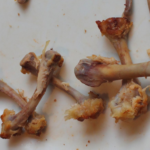 Beware when cleaning up meals to immediately throw leftover bones into the outside or locking trash can, and not to leave any dangerous materials in your kitchen garbage, as the scent will be tempting for pets. If your dog has consumed a piece of bone or treat fragment and is experiencing gastrointestinal pain, vomiting, diarrhea, constipation, or is not acting like his or her usual self, seek the advice of a veterinarian immediately. When it comes to the health of our pets, it is always better to be safe than sorry as a harp bone can do a lot of damage! I have a huge passion for animals and so I chose to work with them. I am a Veterinary Nurse and a Positive Dog Trainer.